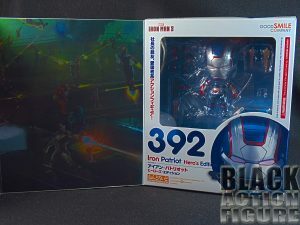 When it comes to some of these slightly inflated Japanese prices, you get what you pay for, and what you get is a beautiful collectors style box for this figure. I almost feel like this shiny almost metallic-like box has a Hot Toys feel to it, or at least a Square/Enix Play Arts Kai feel to it. On the front, you get a beautiful closeup of the figure itself, and on the back you get some poses and action shots of the figure and accessories. 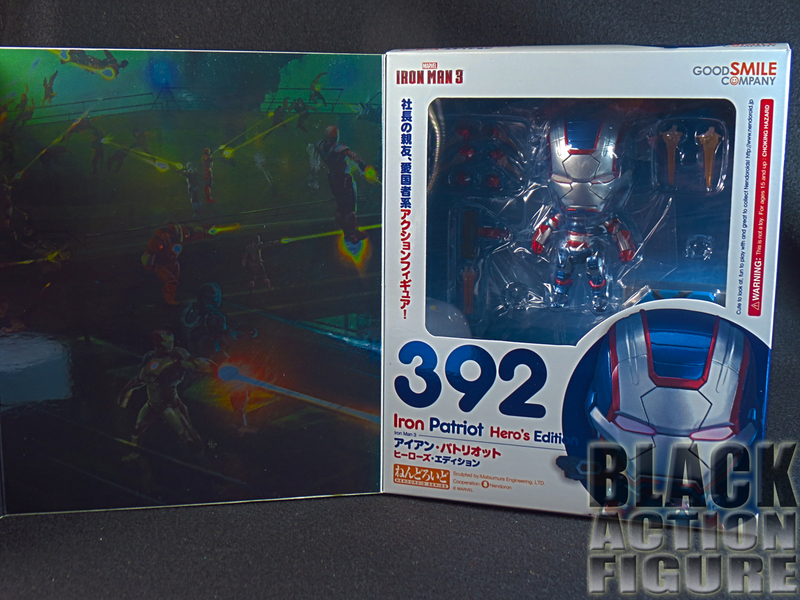 To note, on the packaging it denotes that this is figure 392…can you imagine having almost 400 of these things? I mean, I easily have close to that in 6″ figures, but damn. 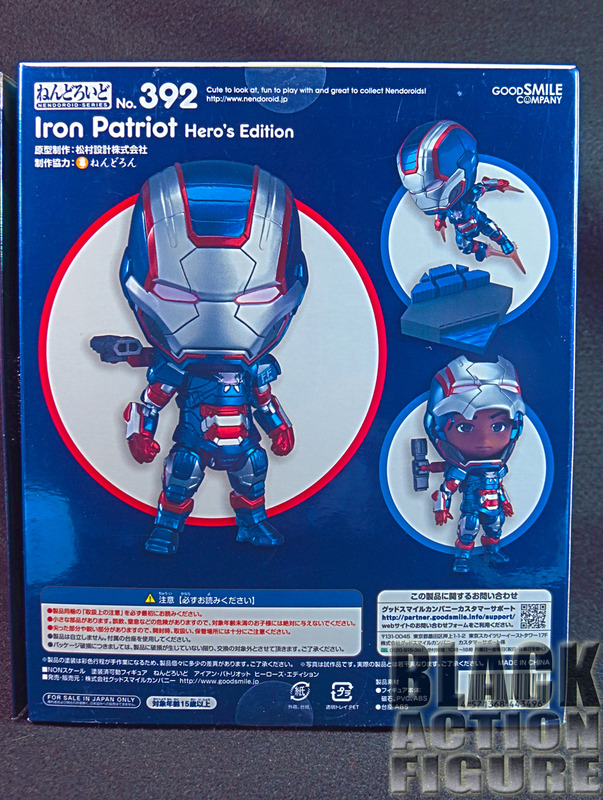 I assume these are cheaper in Japan because I can’t imagine trying to collect all those here…have you ever tried to collect every single Funko Pop! figure? I imagine it would be a lot like that, except extremely harder. 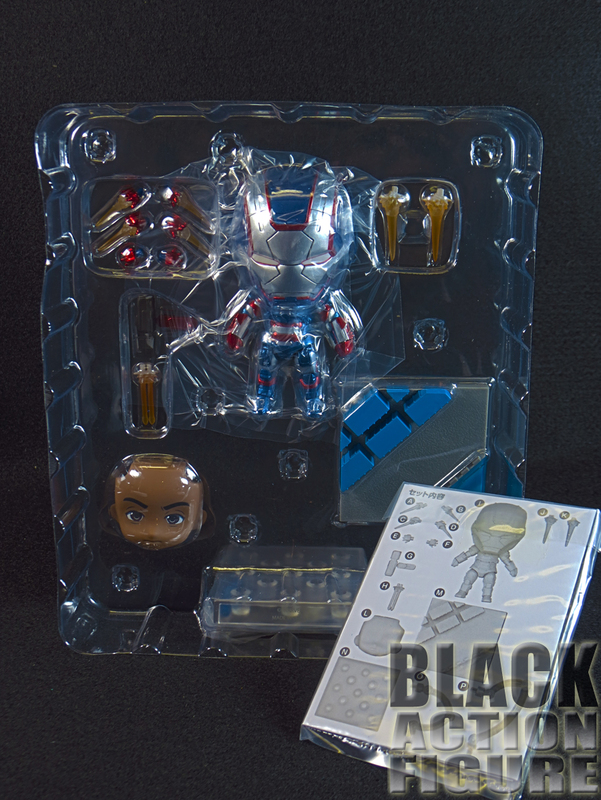 The front of the box has a magnetic panel that opens up to reveal a painted scene of the “House Party” protocols from Iron Man 3 on the left, and a picture window of the figure and accessories on the right. Anyway, great packaging, if not a little bit over the top (maybe), but highly satisfying in the end. 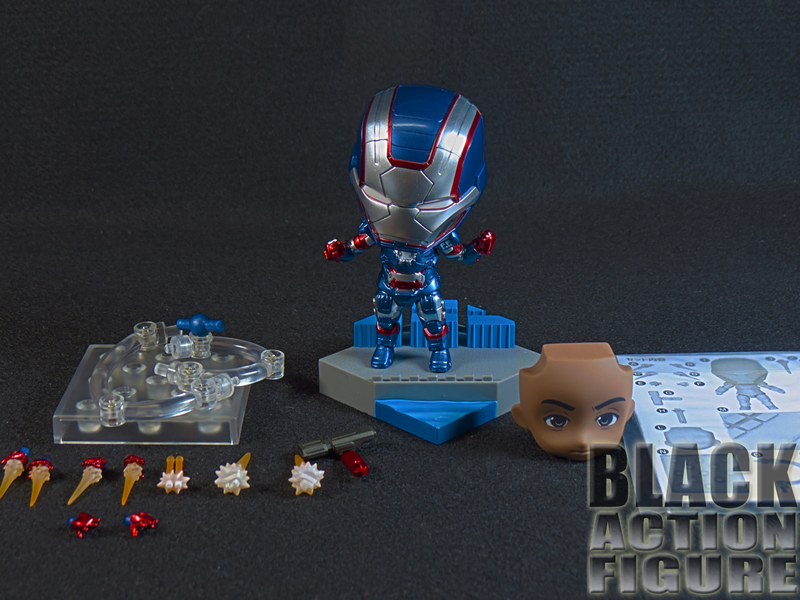 Again, with a premium figure, you expect lots of great accessories…and this one definitely delivers. You get 3 extra pairs of hands, including the open position, the artillery blast, and the rocket hands (along with the original closed fists already on the figure). You get to different type stands along with articulated arms to either keep the figure standing or have it hovering above. 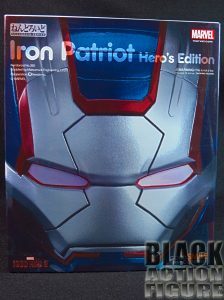 We also get the shoulder cannon, which is a must for a Iron Patriot/War Machine figure (signature look). There are also rocket blasts that fit onto the bottom of the boots. 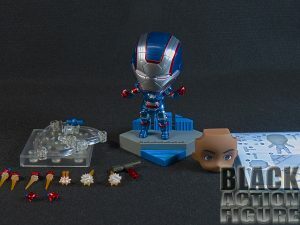 One of the reasons I picked up this figure was the inclusion of a “Rhodey” face. 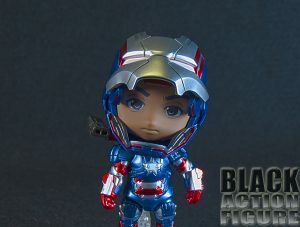 What’s interesting is that it is included as a separate accessory, but after you open the helmet and fit the face in it, it can easily stay there without removing it for as long as you want. 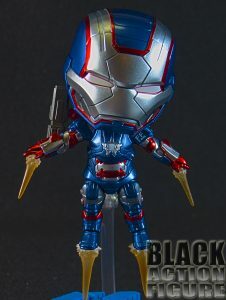 If that was the case, then why didn’t they just pre-assemble the face onto the armor? Save a whole lot of trouble in the end…but who am I to question the Japanese? Speaking of Japanese, the included instruction manual is entirely in Japanese. I was able to make out some of the instructions by the pictures, but the two different figure stands weren’t fully explained so I had to turn to the internet for the best advice. 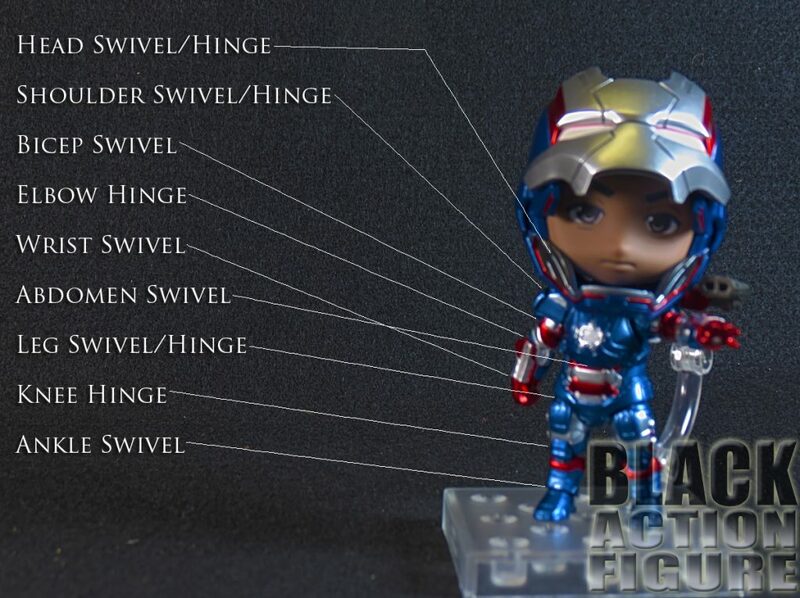 I know this wasn’t made for the American market (which is in itself inexplicable since this is a figure in the colors of the American flag) but I would have appreciated some extra English set of instructions. Side note, these accessories go on and come off very easily…sometimes a little too easy, and them being very small may make it a high potential of losing something. This is another reason I keep the packaging – to store the accessories I won’t be using and to come back to them if I want to. In any case, premium costs, foreign figure, lots of great accessories. This is no doubt a beautiful figure, but it is also a very highly stylized figure. 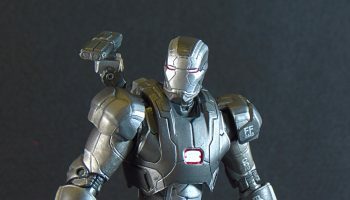 We get the super-deformed War Machine likeness, but not necessarily the Don Cheadle – Jim Rhodes likeness. I mean sure, if Don Cheadle was a 10 year old Japanese animated boy, then the likeness is spot on! 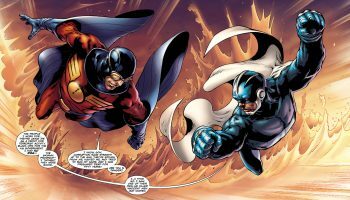 But we know he’s not, so we will have to really address the sculpting and the paint applications. 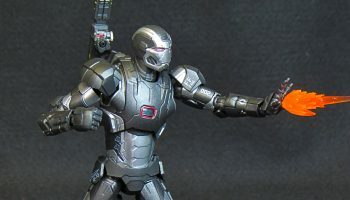 Looking at the paint applications, I love the metallic-like paint over plastic…it originally looked like that this figure might be die-cast from the paint application, but I was proven wrong once I had it in my hands. The detail is exquisite. 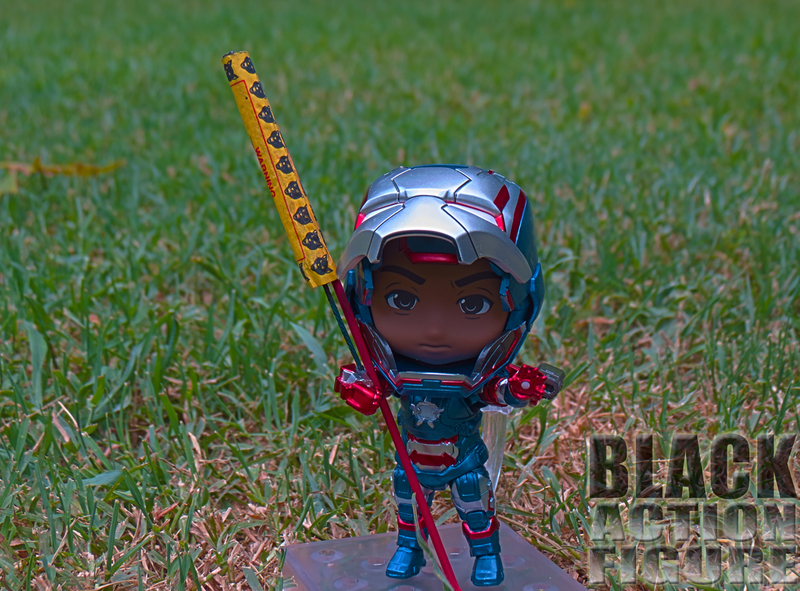 I wonder why this smaller figure has a better paint application than most 6″ and bigger figures. The sculpting is great. Again, it’s stylized, but that makes me appreciate the figure more because of it’s uniqueness. It won’t go in the regular collection shelf, but may find it’s way on my desk or somewhere strategically placed elsewhere in the house…out of the loving reach of my 2 and 4 year old of course. Including the shoulder cannon, this figure has about 23+ points of articulation. 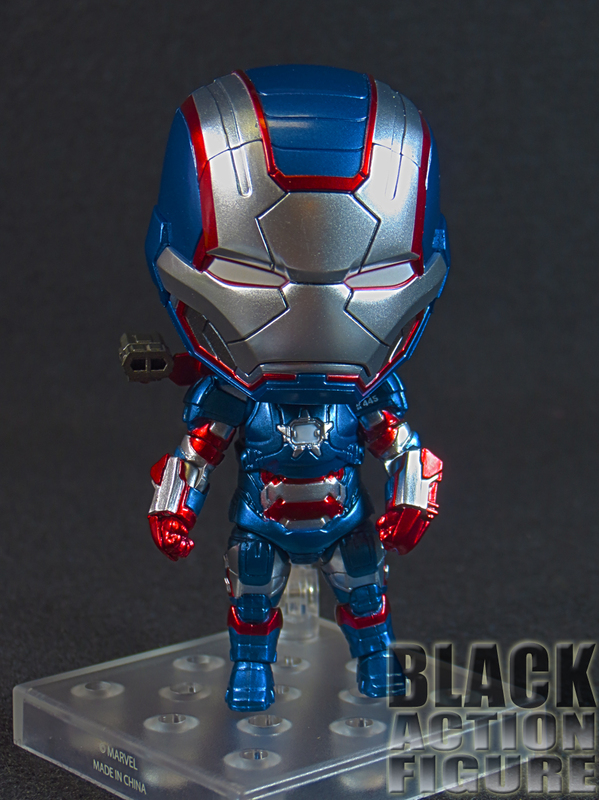 Not bad for a 3.5″ figure. The arms themselves have a great range of motion, allowing for a number of great poses when paired with all of the accessories. In contrast, the legs are very limited in motion. Case in point, the ankles are on some type of ball joint…if you try to point the figure’s toes down, then the whole foot just pops off the joint. This figure comes apart very easily, with almost little pressure. That can be a feature and a slight hindrance…trying to pose the figure became frustrating when you finally get the pose you want and the leg falls off for no reason. But when it works, it works great. Not too much bending down or putting the figure in the “super hero landing pose” as Deadpool would put it. 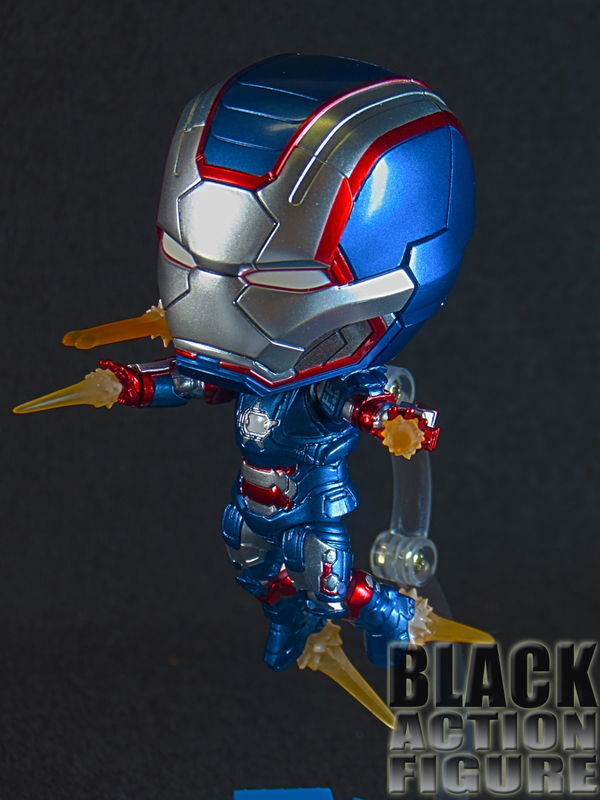 My suggestion is get it in the most absolute pose you like because in most cases this will be how it will stay on your shelf or desk. Decent number of articulation, but lack of full range of motion hurts it some. This is not a common figure that most of you will pick up, but I thought it would be fun and patriotic to review it over the Independence Day weekend. I had a couple of reviews in the pipeline with photo shoots completed and ready to go, but I had to go ahead and do this one from beginning to end today because I’m all about the Red, White and Blue. I hope you have (or had) a fun Independence Day! Remember the three f’s…Food, Family, and Fireworks!